These morbid symptoms are all around us including ignominious military excursions in Iraq or Afghanistan, the bombing of Libya (and possibly shortly Syria), the erosion of social security, privatisation of health, education and even water. From its state of perpetual war, underpinned by ever more intrusive surveillance and draconian legislation, to the continued occupation of the north of Ireland. From the pathetic echoes of empire abroad to foodbanks to zero hour contracts at home the UK is a state increasingly at war with itself. This post imperial state turns on the poorest, most vulnerable citizens as the elite seeks to preserve their privilege just a bit longer. And yet, it is clear the alternative is not yet ready, not developed enough to replace this Ancien Régime. Scotland’s independence referendum (and the Westminster election result in Scotland) was an expression of the reality that for most people the UK state does not work. It has been held together by a British ideology which does not represent the lived experience of its citizens. This ideology is not a representation of the UK state rather it is a misrepresentation of that reality. The current debate about more powers for the Scottish parliament (and English Votes for English Laws) only serves to illustrate how out of touch the state, and the political state apparatus, has become. The Union of 1707 as we have known it is over. The centre cannot hold. Attempts to deny this reality, from Blair’s ‘Devolution all round’ strategy to last year’s constitutional referendum, have only served to compound the problem. Demands for more powers, and attempts by the state to devolve more powers, miss the point. The question is not what constitutional changes will fix the state, the question is what replaces the UK state? Do we continue to drift as various, top down initiatives fail to deliver or do we create the conditions for a bottom up movement for change across these islands? A movement (or movements) for constitutional change driven not by a neoliberal race to the bottom and underpinned by bourgeois nationalist myths but rather driven by the urgent need for social and economic transformation and underpinned by the principles of mutual solidarity and respect. Of course our present rupture cannot be viewed in a vacuum. 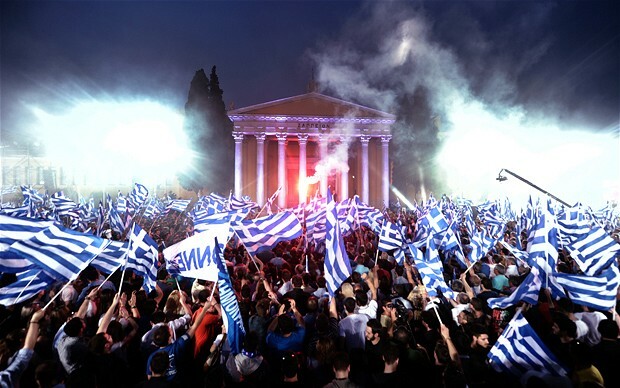 Events in Greece throw certain pro-independence positions into doubt. Primary among them is the notion of ‘Independence in Europe’, which was always a better slogan than it was a strategy. The received wisdom is that a UK in/out referendum on the European Union would hasten another independence referendum in Scotland. This may be so. However another piece of received wisdom is that the pro-independence parties/groups would vote en masse to remain in the European Union. Again this may be so, but after the Greece crisis these are assumptions worth reconsidering. While nobody in Scotland thinks it would be good politics to be on the same side as UKIP and the Tory right campaigning for a No vote in the EU referendum, after Greece it might not be such a no brainer. Would an independent Scotland, on the periphery of the European Union really fancy negotiating with the people currently torturing Greece? What the crisis in Greece and, in different but connected ways, the Scottish independence campaign raises are profound questions about the nature of the European Union, independence, sovereignty and capitalism. In what is by far the best piece I have read on Syriza, Paul Mason describes how they developed their strategy from the thinking of Greek theorist Nicos Poulantzas. Building an extra parliamentary movement and a party in tandem. However as Mason says “Syriza was always a party before it was a movement”. Building the electoral vehicle, the party, in advance of the social movement may turn out to be a serious error. In a Scottish context one lesson from Greece is that an analysis of the state and state power is vital. Although as Poulantzas would have been quick to point out there can be no general theory of the state. We must analyse the specificity of the UK state, particularly the UK state in Scotland. Perhaps even Scots in the UK state? The point is that only then, once we have an analysis of state and state power, can we identify the spaces where we can resist. Or more precisely where we can work with others to organise effective resistance. It is in these spaces we can build the working class movement out of which an electoral vehicle may (or may not) arise. There are no short cuts. It is absolutely understandable (not to say desirable) that people should reject the old order that has shown itself unable to deliver for working class people. The ideological attack on social securities and the neoliberal obsession with austerity, as a political device designed to strip away rights, protection and solidarity amongst workers, has led to people looking for alternatives. One consequence of our rejection of the old order, in the UK and in the European Union, has been the rise of nationalism. Not just on the periphery of Europe but right in the centre. Of put slightly differently in the dominating nations as well as the dominated. The Eurozone crisis has led many to completely reject the supranational project. I repeat, this is understandable at this political and economic conjuncture. However it seems to be based on a false assumption that by leaving the European Union we could return to a world of independent, sovereign nation states existing in isolation. The reality, both historically and politically, is far more complicated. The Polish sociologist Zygmunt Bauman, who along with philosopher Etienne Balibar has used the concept of interregnum to describe the current European milieu, argues “Sovereignty nowadays is, so to speak, underdefined and contentious, porous and poorly defensible, unanchored and free-floating”. Whether this is an accurate description or not the principle must be that independent nations have the right to decide which areas of sovereignty they wish to pool, or cede, or not. It is unacceptable that German hegemony in the European Union appears to lead to these decisions being forced on nations. The crisis in Greece brings into sharp focus the need for change in the European Union. Greek resistance has shown that continuing punishment inflicted on nations from the centre is not sustainable or politically viable. Of course, neither is it desirable. The task is to reject these top down diktats while retaining our faith in solidarity and shared protections. We can absolutely condemn the way Greece, its government and its people, has been treated by the European Union, Eurozone, IMF etc without believing we can return to some nation state isolationism. It is far from certain that Greece exiting the Eurozone and devaluing its currency would improve the material conditions of the people of Greece. It is far from certain that being outside the European Union would provide more opportunities for rebuilding social securities and developing solidarity. To address these morbid symptoms we need, in Balibar’s phrase, to create ‘a Europe that still needs to be built’. To do that we must think deeply about the nature of our struggles and develop new strategies tasked with creating a bottom up movement, or movements, capable of resisting austerity and nationalist mythology. We need to return to James Connolly and build ‘a free federation of free nations’.